Next week marks 7 months since I was made redundant, and four since I started the blog. It’s the perfect time to take stock. The Speedy Swimmer is absolutely right. I am itching to get going and get back into the workplace. The last ten days have been focused on contacting people, arranging meetings, booking onto courses and sending off applications. I am positively looking forward to January. So whilst I might sometimes feel nostalgic for the job and the things I loved about it (and grrr every now and then still be a bit cross) I am channelling my enthusiasm for swimming, books, baking, people and communicating into making a new working life. I have been in limbo and now I am moving on. Rather than missing and wondering about the people I worked with I’m jolly well going to get in touch with them. I need to make new networks and new connections rather than harking on to myself about the old life. The sun was shining, which pool to choose? 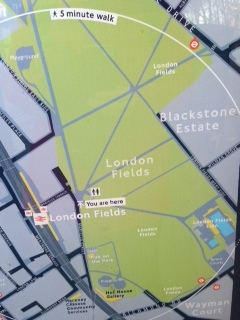 Good intentions buzzing in my brain I caught the train mid-morning to London Fields to the glorious 50m lido there. There were 4 wide lanes in operation which means there’s plenty of room to overtake without bashing into other swimmers. I like the fact that the Very Fast Lane (their underlining) states no breaststroke. It was glorious. Proper sunshine glinting on the water and a nice temperature of c21’C found some swimmers in their bikinis. Longer pools mean better rhythm. I find it much easier to lock into a rhythm in a big pool. Every time I get into a pool I turn my swimming engine on, but I sometimes struggle to keep in gear and end up ploughing through the water. Today, with a six strokes per breath cycle I quickly got into my stride gliding through the water. 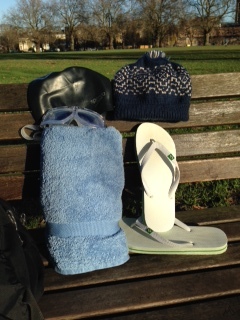 My swim kit for today’s swim on a nearby bench. NB I was wearing a costume too, and the hat was much needed afterwards. Flip flops are essential, however strong the winter sun it never warms the pool surround and your feet get cold walking to and fro the changing rooms. Actually although the water was warm, and the poolside showers scorching hot, my hands stayed chilled for a couple of hours. Today’s swim reminded me what a friendly sport outdoor swimming is. For some reason people are much chattier. I don’t mean in a standing around clogging up the shallow end gossiping way but in a smiling at people in the shower way and comparing notes on swims way. You’re pretty unlikely to strike up a conversation with the person next to you in an indoor changing room, whereas it’s a different story out of doors. I got talking to one lady about her swimming hat, it was bright blue, with ‘WORLD’S BEST SWIMMER’ on it in white writing, with a line above saying ‘it’s not easy being the’…. and underneath ‘so let them enjoy it’. Cool present for a proper swimmer eh. Someone else was sporting a yellow ‘Dart 10k’ cap. I’ve met two other Dart 10k swimmers who run the consultancy Tinder Box and am slightly, actually no a lot, in awe of their swimming prowess. I still think my ‘home’ lido at Parliament Hill has the edge for its shiny stainless steel casing, extra size, absence of rules and location, but after today’s swim this comes a close second in London. Both pools feature in Jenny Landreth’s excellent book about swimming in the capital ‘Swimming London’ – and she’s blogged about winter swimming events too.